1. You have just received a plan notification email from plan intake. 2. Click on the appropriate link in the email and go to the plan. 3. or-- Select a folder containing the files you desire to review. (you may need to expand parent folders to find a folder with files). The folder list is replaced by thumbnail images of each file contained in the folder. Under each thumbnail, the file name, author, date, and any relevant file icons display. These icons are shown below. 4. To return to the folder view, click the View Folders button. 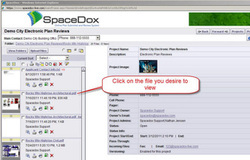 By default, Brava™ displays in the right pane of the Spacedox window. 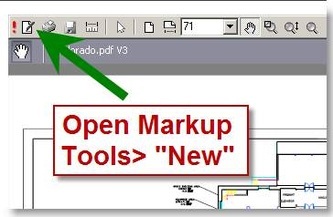 To launch drawings in a separate browser window, click the radio button above. You can switch it back at any time by clicking the radio button. After switching radio buttons you must refresh view using refresh button. 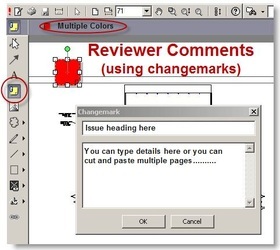 NOTE: It is recommended that changemarks always have comments. The comments and titles are searchable. All markups, regardless of type, are linked to the author. 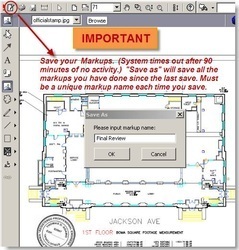 On a large set of plans you may save your work many times during the review. When your review is complete you can designate it with something like "Review Complete" and notify plan outake that you are done. They will gather the other reviews (see intake link above) and send them to the applicant.